Proloquo2Go is a symbol-based communication app that promotes language development and communication skills for beginners and advanced users. 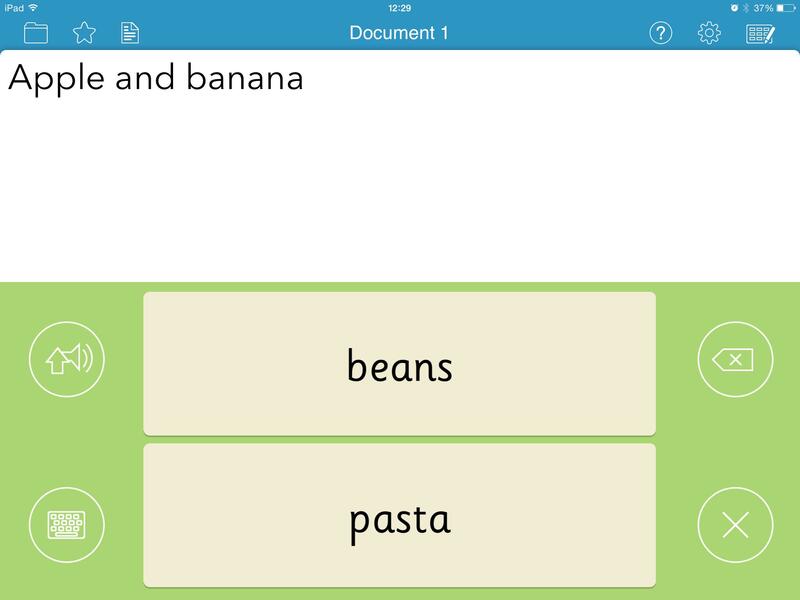 This software program is available for iPad, iPhone and iPod touch from AssistiveWare and has the ability to customize and edit for the individual as they grow their communication and vocabulary skills. Proloquo2Go boasts being the only AAC app utilizing vocabulary level activity and templates to support motor-planning that is easily fully customizable for the user. Since version four’s release date earlier this year, Proloquo2Go’s updates have further enhanced the software with new features including alternative access, core and activity templates, and multi-level vocabulary. Proloquo2Go introduced five different scanning modes and alternative, accessible keyboards in previous versions. The biggest change for alternative access has been the addition of auditory scanning, which has the potential to help visually impaired users and users with poor attention and scanning. In addition, Select on release is an additional feature that helps users make a selection by allowing them to slide their finger onto different items being touched, but only the last item touched on release will be selected. Proloquo2Go 4 also includes core templates and activity templates. The core templates keep core words in a consistent location. This new feature will help users develop motor planning skills when using the program and can help increase efficiency and learning. The activity templates offer a solution to activity specific pages that are used once with specific words and then never used again. The activity templates use the core vocabulary that appears, again, in a consistent place on the home page. Using an activity template, a user can create a folder with specifics to the activity that utilizes fringe vocabulary, but the core vocabulary remains in the same place which will make it easier for the user to locate items. The templates have themes such as create, motor play, out and about and reading. When utilizing activity templates, the user will be prompted to choose a category and the core words will be automatically populated. Proloquo2Go 4 utilizes research-based Crescendo vocabulary that offers three levels of vocabulary: basic communication, intermediate core and advanced core. This new feature was created as a solution to only having one very basic and one very complex vocabulary system that made some users “stuck” in the middle. The basic communication level offers sentence starters and helps users develop communication skills for basic needs, making requests and simple commands. The advanced core is a complex system for those able to navigate vocabulary and subcategories to have complex communication skills. The intermediate core bridges the gap between these two vocabulary levels. Users have access to all core words and can begin to develop more complex sentences and communication utilizing customizable fringe words that have been reorganized to improve navigation and more manageable subcategories to adjust to a user’s needs. The newest version of Proloquo2Go offers additional features such as improved grammar support, customizable grid sizes, folder sharing, regional vocabulary variants and snapback features. More information can be found on https://www.assistiveware.com/product/proloquo2go regarding new features, resources, and information about Proloquo2Go software. With an overwhelming number of apps to ch oose from these days, it can be difficult to know which ones to use or try. UKS Mobility created a list of 45 mobile applications that have good reputation for being tried, tested and successful for use with a variety of people with disabilities. 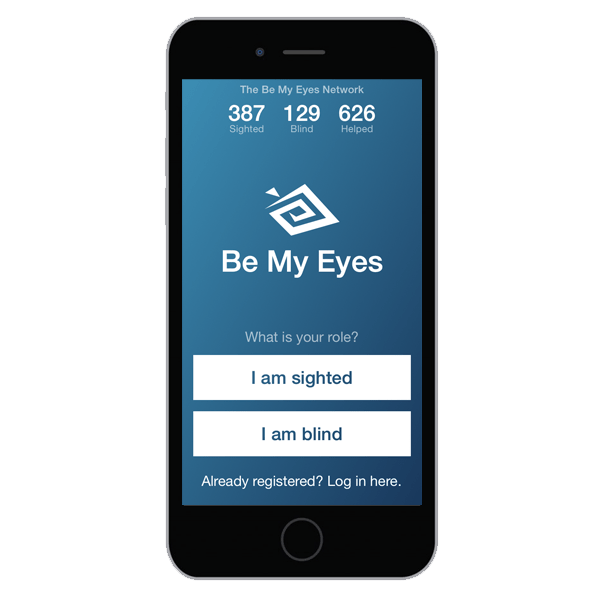 Applications are divided into easy-to-navigate, color-coded categories including blind/visually impaired, deaf/hearing impairments, dyslexia, autism, wheelchair/mobility scooters, and Alzheimer’s and dementia and labels each app clearly for compatibility with Apple or Android. Example applications include: Be My Eyes, Voice Dream Reader, Sign Smith ASL, Wheelmap, Dyslexia Toolbox, TapToTalk, iComm, Spy Sam Reading Cards, Alzheimer’s Cards, Medication Reminder, and many others. 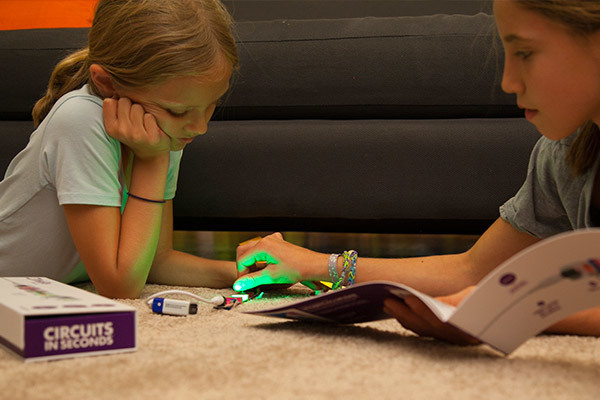 littleBits Electronics sells various electronic kits that enable anyone—kids, parents, teachers, therapists, entrepreneurs, experts and amateurs to create solutions and innovative technologies. No soldering, no programing, and no in depth knowledge of circuitry required. Parts are color coded by function (green-power, blue-output, pink-input, orange-wire) and connect via magnets to make it easy to build and create solutions and technologies. There are various kits available including gizmos and gadgets, base kit, student set, hardware development kit, workshop kit, space kit, Arduino coding, cloudbit, smart home, as well as many others. Individual parts are also available for purchase to expand existing kit or replace parts. Not sure what to do with a kit? No problem. There are hundreds of free, online electronic modules with step-by-step directions to create products including: holiday decorations, arcade games, classroom activities, child’s play, etc. One particular kit with practical projects is the smart home kit, with many project modules including: SMS doorbell/answering machine, coffee control, laundry done alert, don’t leave home without it machine, wireless lighting, and remote pet feeding. Another useful kit is the gadget and gizmos or student kit that can provide teacher-friendly materials to engage students in creating, inventing and working with electronics/science. In addition to kits to purchase, littleBits has created the bitLab that allows anyone that has an idea for hardware to submit their innovation for review. If a submission receives more than 1,000 votes, littleBits will actually prototype and produce the prototype for feasibility and manufacture product for purchase. 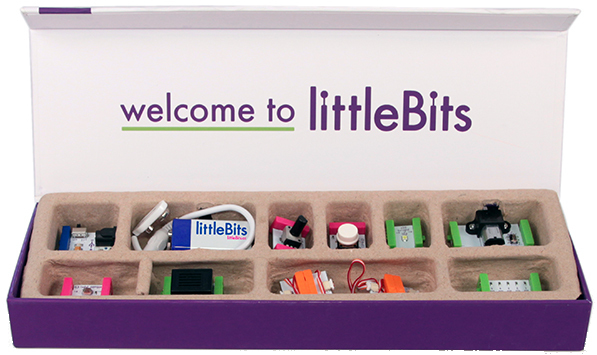 For more information on littleBits or to purchase a kit, visit http://littlebits.cc/. Have your voice heard: NCBI and CIT Nimbus are recruiting people with a range of disabilities to share their experiences regarding participation in research or design. This opportunity will be held this fall in Whitworth Road, Drumcondra, Dublin with a group discussion to share perspectives and experiences. Participants will be asked to participate for an hour and a half and will receive €40 for their contribution. 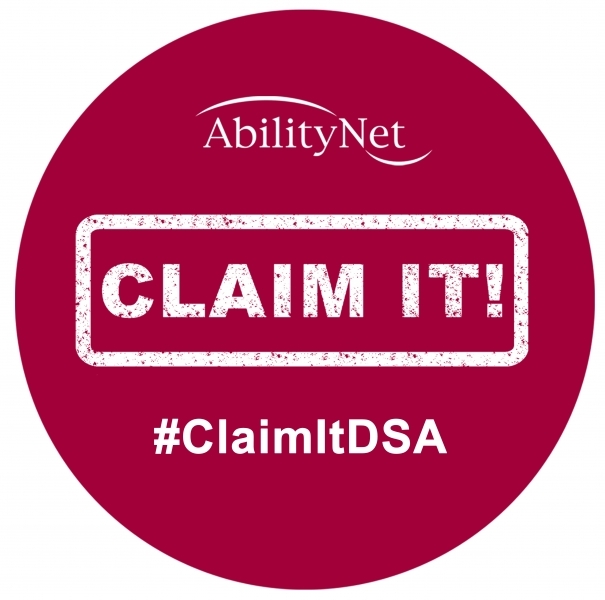 AbilityNet launched the DSA Claim It! campaign to encourage students in higher education with dyslexia, dyspraxia, sensory impairments, Asperger’s syndrome, physical disabilities, chronic health conditions, anxiety, depression, etc. to look into eligibility for free grant money in addition to standard student finance packages to support their education. Disabled Students’ Allowances (DSA) are grants that help students pay for extra equipment, tutoring, note-taker, travel costs, books, photocopying, and additional costs to higher education. AbilityNet reports that half of all students who are eligible for grant money to help cover these educational cots did not claim for the 2013/2014 school year. Shane Lynch shows support for students to find out if their eligible for the campaign and discusses his own journey to getting tested for dyslexia. Watch Shane Lynch’s video and learn more about the campaign. There are many resources and applications that have been found to help people with dyslexia and other learning difficulties. Below are a few links to various apps that could help a wide variety of students with reading, writing, literacy and education. ClickerDocs is a word processing literacy app for emerging writers. It is one of several apps created from Crick software to support literacy on the iPad. The application utilizes word prediction and customized word banks to increase productivity and learning. Document settings– Choose from over 50 fonts, many of which containing accessible san serif fonts and single-story ‘a’ fonts for ease of reading and learning. Choose font size, background colour and text colour. Speech settings– Change the voice and speed of voice. Choose options for voice to speak every letter, every word or every sentence. 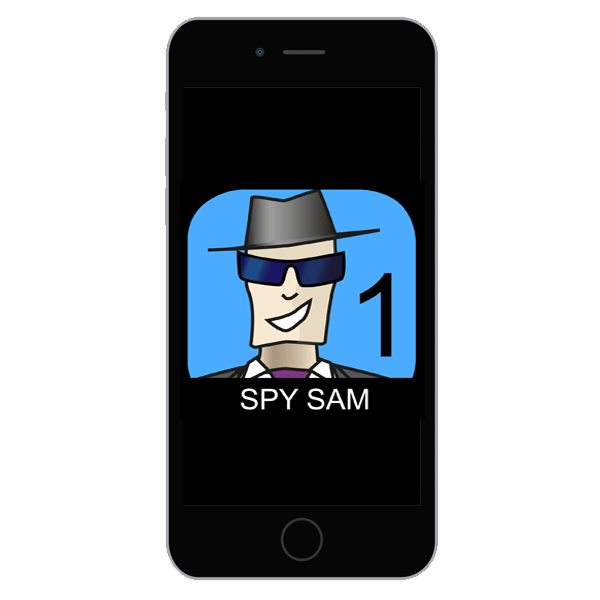 Spell checker & predictor– Turn on/off spell checker. There are options to turn on/off predictor, SoundsLike prediction, and predict next word. Choose database size for prediction based on need of writer, and change number of predicted words displayed on prediction bar. Sharing– Turn on Dropbox, Google Drive, OneDrive and WebDAV for sharing PDF or text files. Accessibility features– Turn on swipe grids, slow touches and SuperKeys. Choose between QUERTY and alphabetical keyboards. Letters are in lower-case unless shift is chosen. 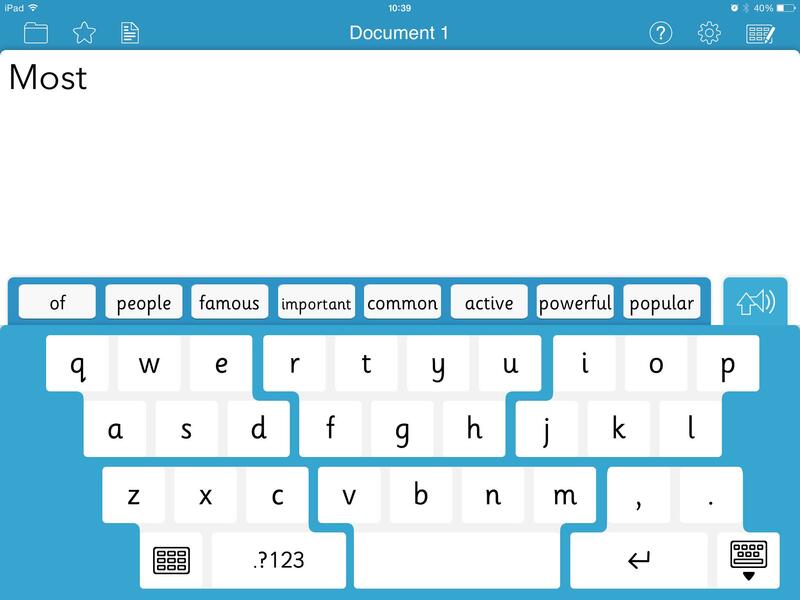 Word prediction, speech output, changing font and keyboards… so far it sounds like a lot of other literacy apps, right? What makes this app stand out is its use of word banks, customized word prediction and speech, and SuperKeys accessibility option. Let’s talk about these features a bit more. SuperKeys organizes keys into 6 clusters. A child would select a cluster containing the letter or word they need. (See left picture below.) The letters/words are enlarged in a separate box to make a more precise selection. (See right picture below.) This feature would be great for populations with physical challenges where having a larger target area would be beneficial. Word banks/grids are highly customizable and a great feature for beginner writers who would benefit from word choices. 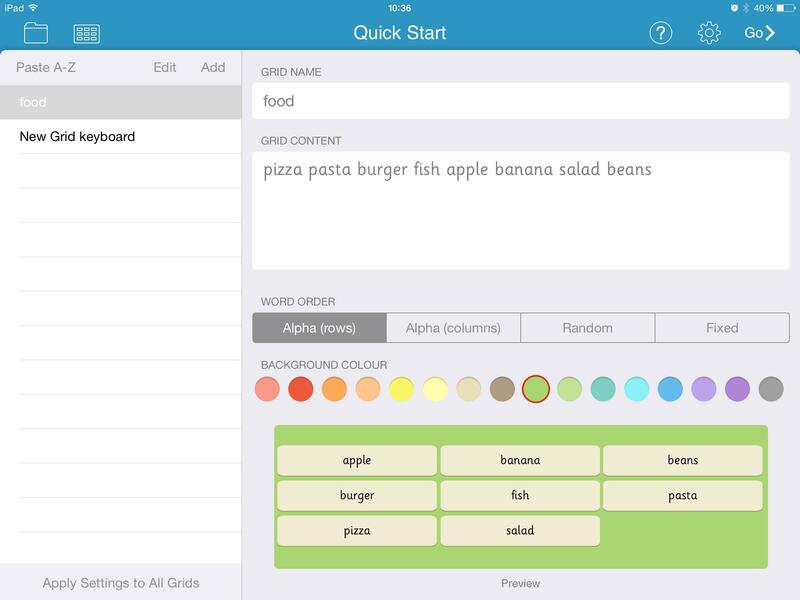 New grids can be created in minutes: users name the grid, list the word options, choose word order and colour. (See picture below.) Colour-coded grids are listed at bottom of screen to tap or swipe between. The grids can be added/deleted quickly to customize how many choices are available. Free LearningGrids can also be downloaded from Crick. Grids can also be shared between devices and for multiple students and transferred directly into Dropbox for ease of access and set-up. ClickerDocs customizes word prediction and speech. The database size for word prediction can be set to small (250 words) for beginning writers, medium (2,500 words) for emerging writers, or large (20,000 words) for more advanced writers. Users can choose to have writing read after every letter, word or sentence is typed in the settings. A great additional speech feature that is not listed in the settings is the ability to read out loud an entire text/paragraph. Users can select the SoundShift tool (the blue icon above the keyboard/grid) and triple tap the text to hear the entire paragraph/written text. The word prediction is unique from the variety of word prediction settings. SoundsLike prediction is a useful feature for emerging writers who often make mistakes by spelling based on sound. Predict next word is useful for emerging writers to form sentence structures and increasing vocabulary. As I’ve described, this application has a lot of great features and a lot to offer users, but there are some drawbacks. 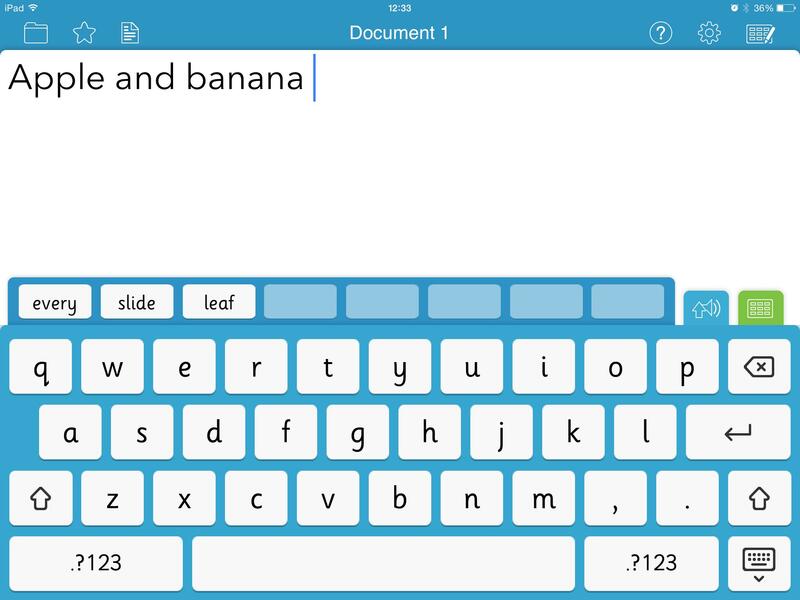 One feature of Abilipad and other similar apps that this app doesn’t offer is the ability to customize keyboard layouts with letters, words, sentences or pictures with audio recordings. This could particularly be useful for beginning writers who would benefit from pictures and sentence options that deviate from standard keyboard layout. The SoundShift button is a very helpful feature in order to read a word before selecting it and to read a sentence or paragraph on the screen. If a user wants to hear a word before choosing, they tap the SoundShift button and then the word they want to hear. However, it has a limitation: there is no way to lock this feature. If a user wanted to hear every word before selecting it, they would have to select this SoundShift button every time. It would be useful to have an option to lock this feature so the first tap was to hear the word and the second was to select for beginner writers with difficulty reading who would benefit from hearing the word first. While I am a big fan of the SuperKeys feature, it has one downside as well: poorly placed keyboard/grid icon to switch back and forth. When not in SuperKeys mode, the grid icon (along with other icons) are intuitively and uniformly placed on top the grid set. It’s very easy to select the green keyboard/grid icon to switch back and forth between keyboard and word bank (See pictures below). When using the keyboard option, these icons are placed on keyboard that are visible to user to select. However, the placement is not consistent to the non-SuperKeys keyboard and may take additional time to learn and utilize. While SuperKeys is a great option for some, this is an organizational feature that requires additional time to become comfortable with the location of the keys and how to switch between grids and keyboards and make selections. Despite the drawbacks to this application, I find it incredibly useful. The application provides a mobile literacy support that has a lot of features that would support a wide variety of skills and needs, especially those who would benefit from prediction and word bank options. Teachers, therapists, and parents supporting the user can learn this application quickly and create grids easily. 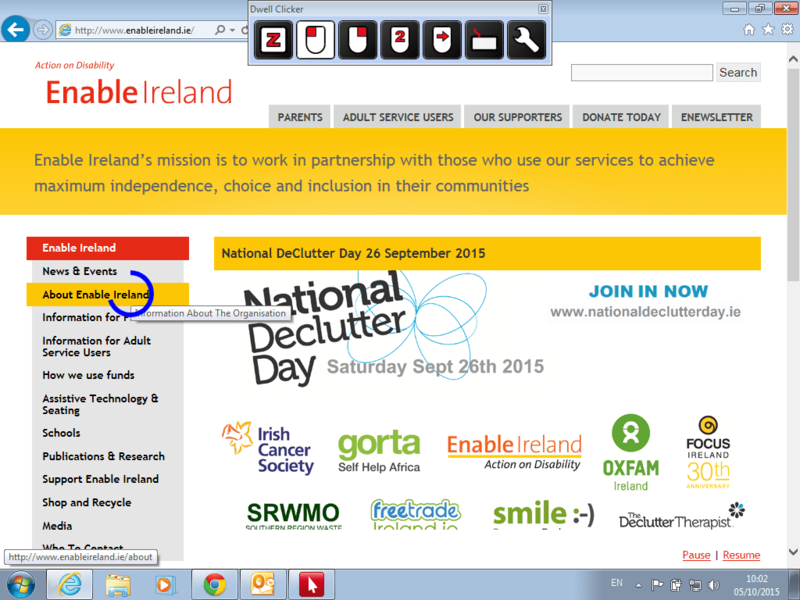 Clickerdocs costs €30.99, but is well worth the cost for the variety and depth of features available. Dwell Clicker: Click-less access to Windows OS. Dwell Clicker 2 allows a user to access the mouse or pointing device without clicking buttons. The person simply points to an area on the screen and leaves it in that position. After a specified time, the application automatically clicks where mouse is resting. This dwell time is adjustable in the settings menu. This program is ideal for people who use alternative pointing devices (joysticks, head pointer, etc.) or have a repetitive strain injury. Dwell Clicker 2 is easy to learn and set-up. The basic features include: rest to avoid unwanted clicks when not moving pointer, left click, right click, double click, drag feature to move things across screen, on-screen keyboard, and ability to adjust settings. It comes with additional features including target snapping that makes it easy to click on specific items, buttons on screen; visual dwell display provides progress bar to measure time to wait before automatic click; and click clock allows the user to lock a type of click to prevent return to default left click. The application provides a 30-day full access trial period available for Windows XP or later. After the trial, the application can be purchased for £10.00. If unpurchased, the user will still have access to basic dwelling features, but will lose access to target snapping, visual dwell, and click-lock. Dwell Clicker 2 is only available for Windows. Dwell Click is a similar program designed for Mac OS and be purchased from the Apple Store or Pilotmoon Store.